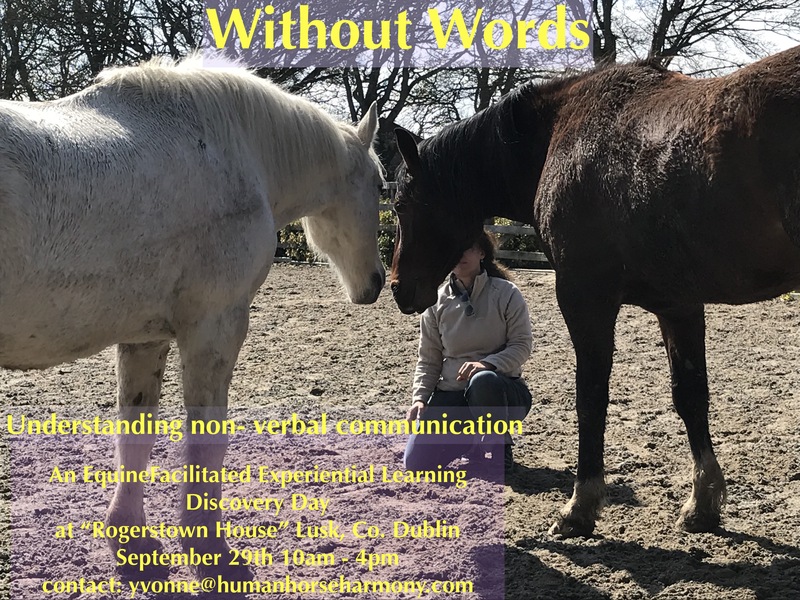 Some 85% of communicating is non-verbal. 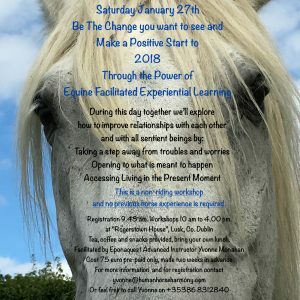 Come to this day and feel the impact this non-verbal ‘language’ has in your life! 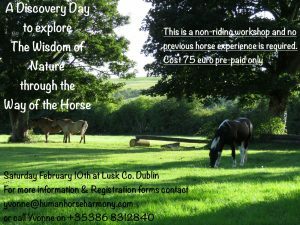 This day runs from 10am till 4pm and the cost is 75€ pp. 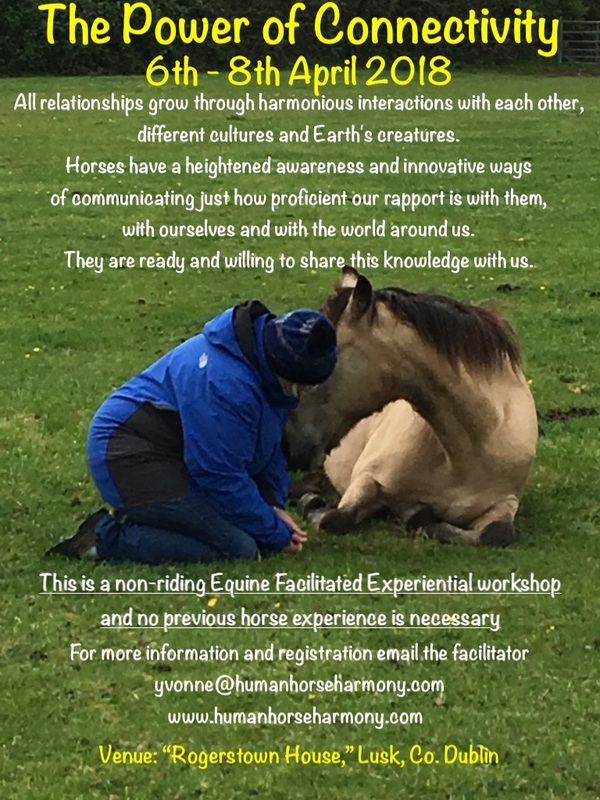 Contact Yvonne at yvonne@humanhorseharmony.com for a registration form. 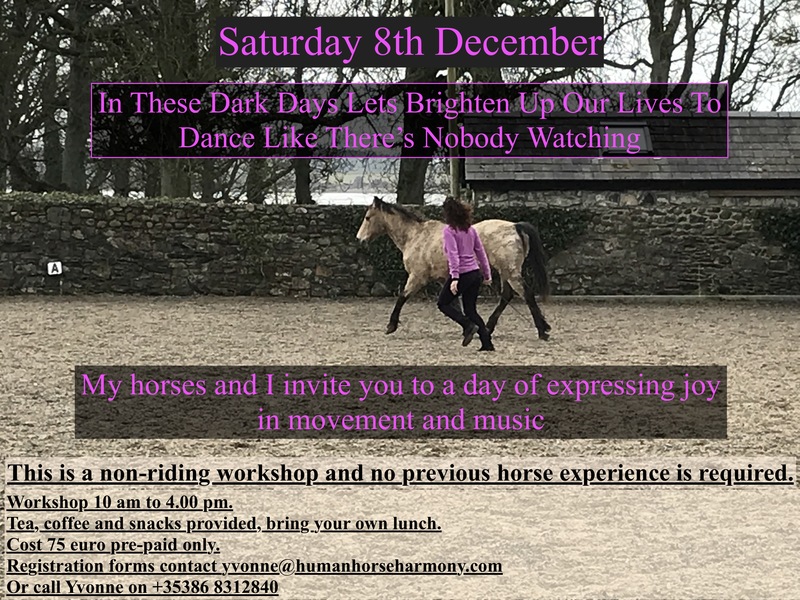 Book early as there are only 6 places available. 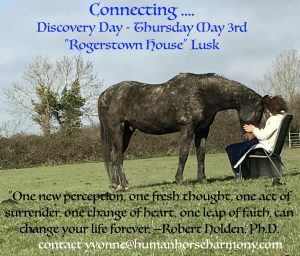 A Discovery Day in understanding just what it is to connect deeply with not only your own Spirit but also with the Spirit that is alive in all living things. 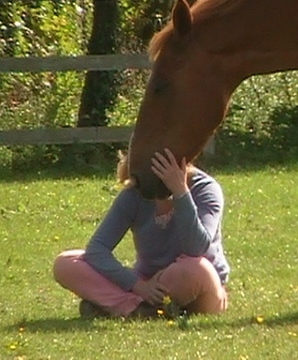 We all know just how important healthy relationships are in our lives. 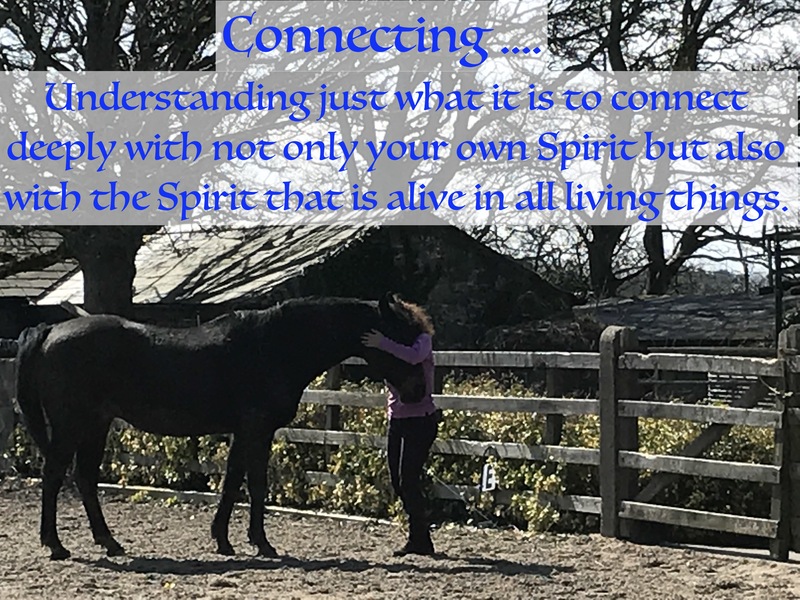 Just what does it take to be authentic when connecting with others? 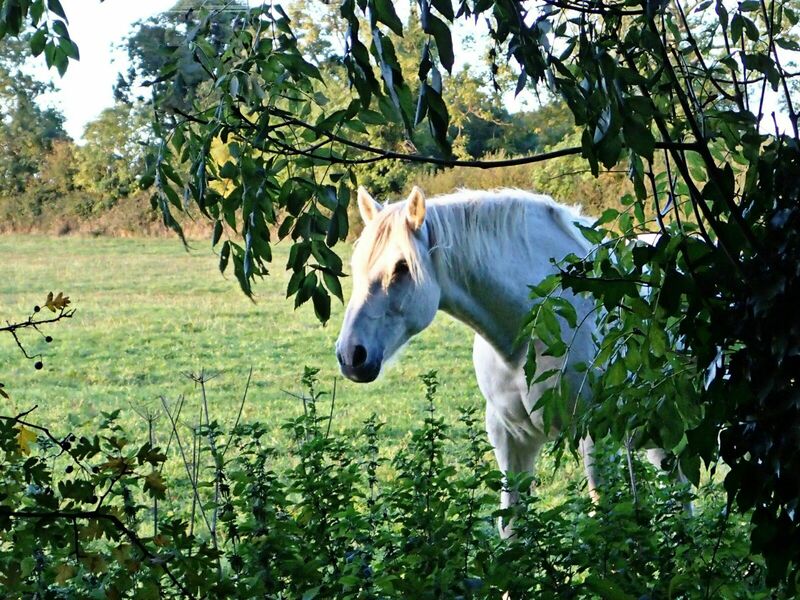 Horses, as highly sensitive sentient beings, have much wisdom to share with us about this. They are amazing facilitators and give instant feedback to us as to our progress. Come an experience this wonderful work! 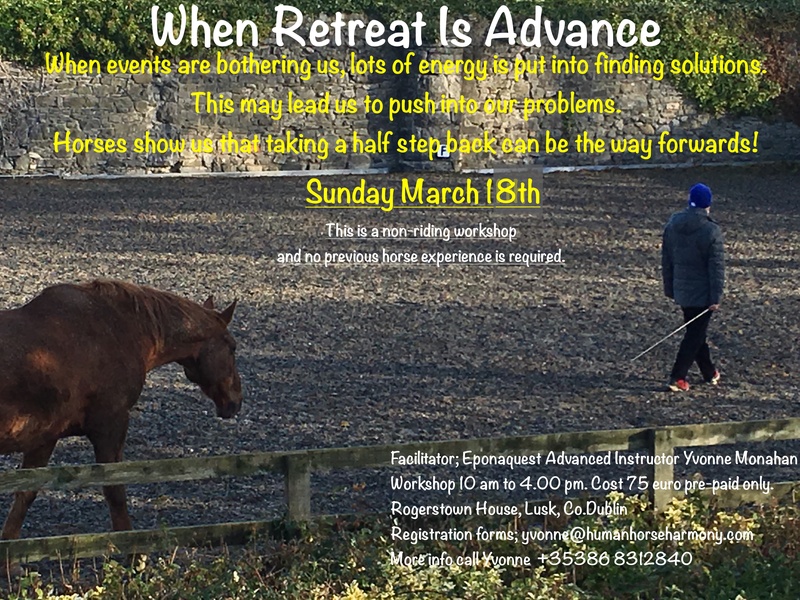 The cost is 500€ (there is an early bird price of 450€ if you register on or before March 27th) which includes all workshop materials and lunch on Friday and Saturday and all snacks / teas / coffees etc. 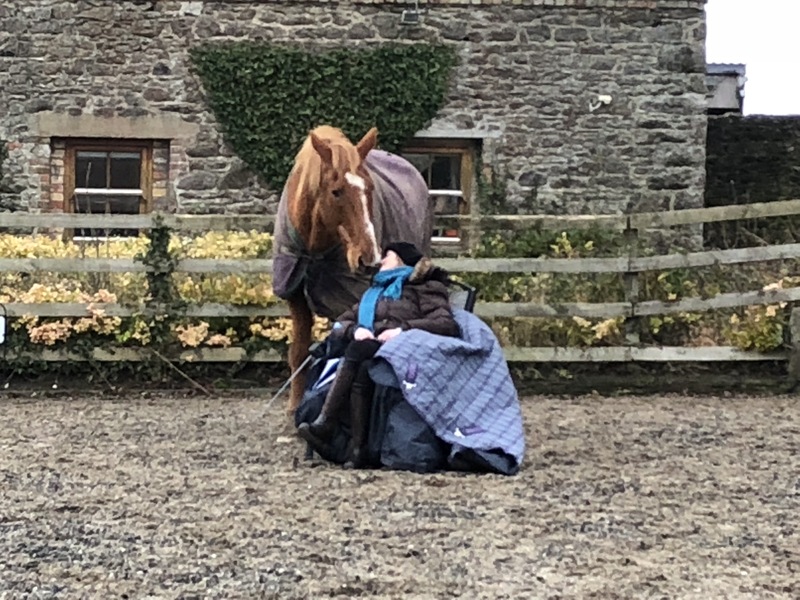 A Discovery Day to consider problems from a different perspective while sharing the horses wisdom. 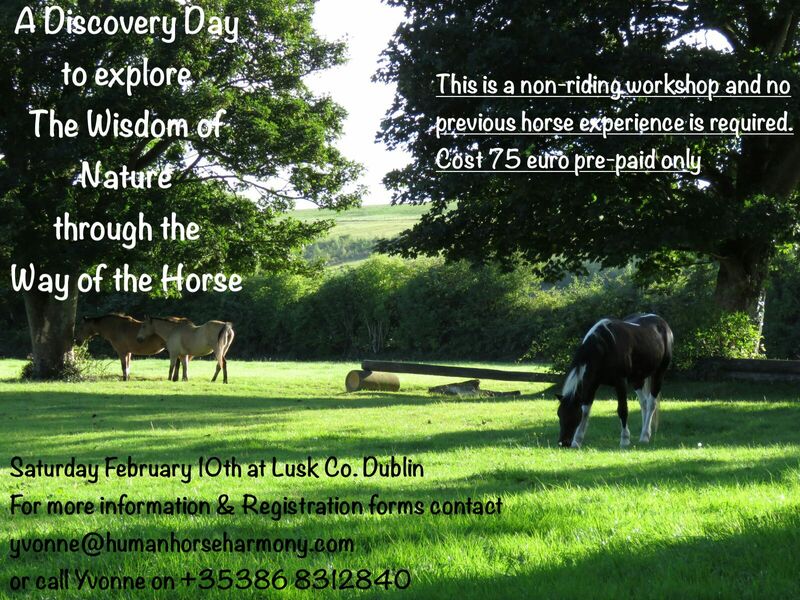 Explore The Power of Nature through equine facilitated experiential learning. This two-part advanced intensive program is an in-depth exploration of the Way of the Horse as a profound journey of self-discovery and transformation. 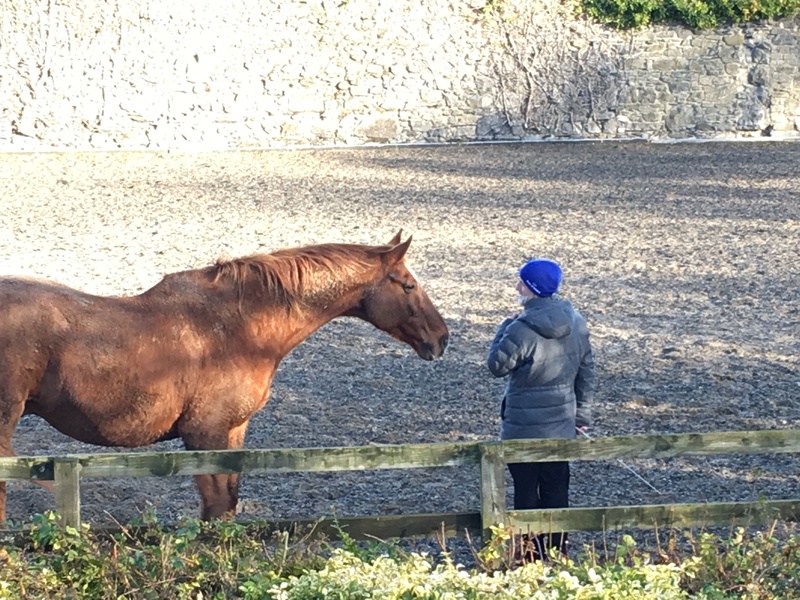 With horses as your inspiration and guides, you will learn life skills for increasing self-awareness, learning to hear your inner guidance, discover your hidden gifts and begin to access inner peace. 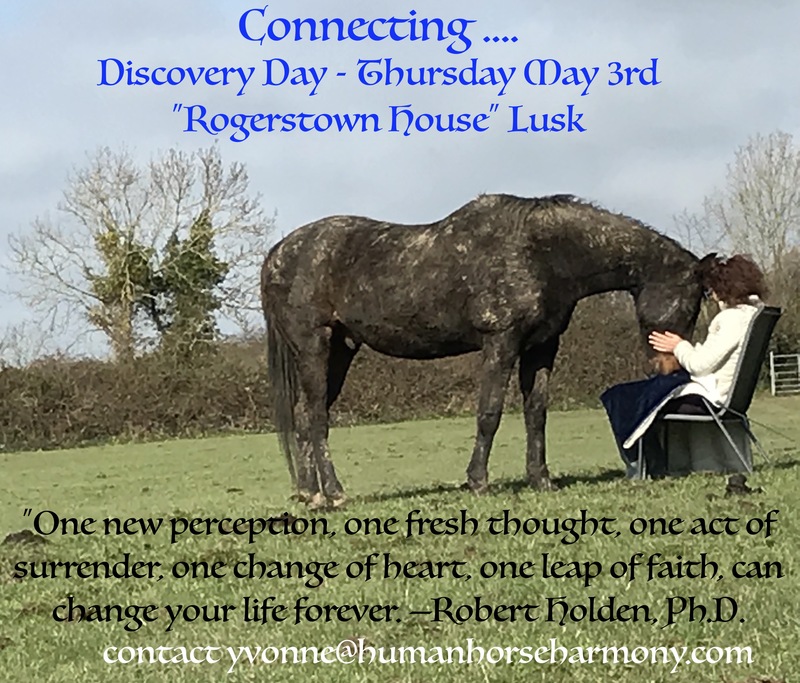 NOW will teach you how to develop an approach to life that enables you to live deeply and awaken to your life’s purpose in a way that integrates all of the wisdom gained from your life experiences. NOW will show the way to your personal wisdom. 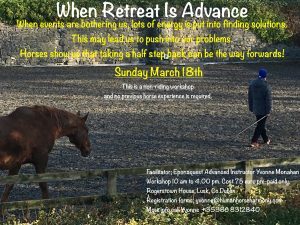 A maximum of eight (8) carefully chosen individuals will meet for a week on two occasions, with reading assignments and conference calls in-between weeks. Prior to acceptance in the program, applicants are encouraged to attend an introductory level workshop. from some deep and holy place within? the journey from false self to true self? and unfold a deeper, more authentic self, the one I intended to be? In response to those questions, The NOW program will focus on teaching you how to take new tools and expanded self-awareness back into your life, family, relationships, and community. You will learn how to be more authentic, set healthy boundaries, and actually live from a larger perspective of who you are and what’s possible for you. The next payment of 1000 euro is due February 1st, 2018. 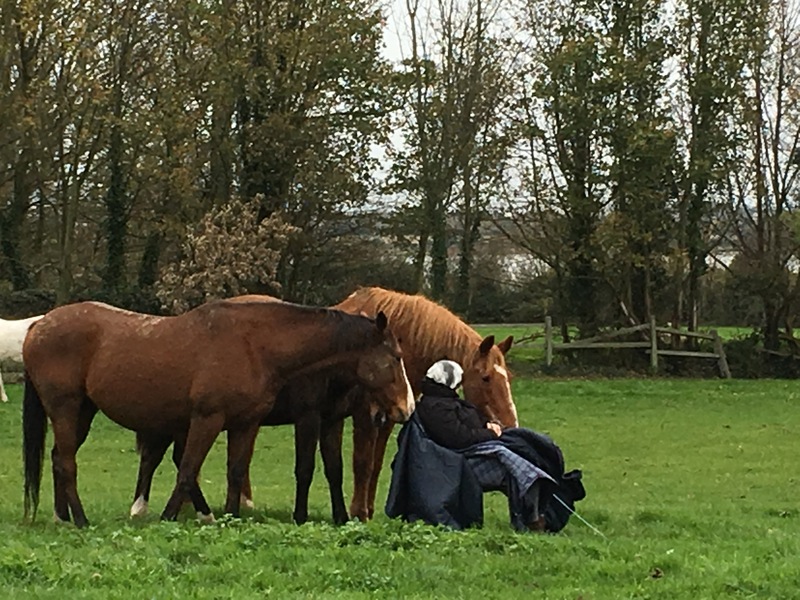 Then the final payment of 1000 euro is due April 1st. (Just a reminder that spaces are limited to 8 participants so they will be offered on a first come first serve basis and a wait list will be kept).